I used Mash Nails Stamping plate Mash-46 from their newest set of plates. The Mash Nails White Nail art polish for stamping is great! It worked perfectly and the design from the plate transferred flawlessly. I love the color combination I chose, it's so summery and delicate. Mash Nails Nail Art Polishes retail for $5.99 each and are available to purchase on their website. Do you like this combination? Have you tried Mash Nails stamping polishes yet? What a cool design. I have a lot of MASH plates already but I think it's time to expand the collection :) The white on green is so neat looking too. 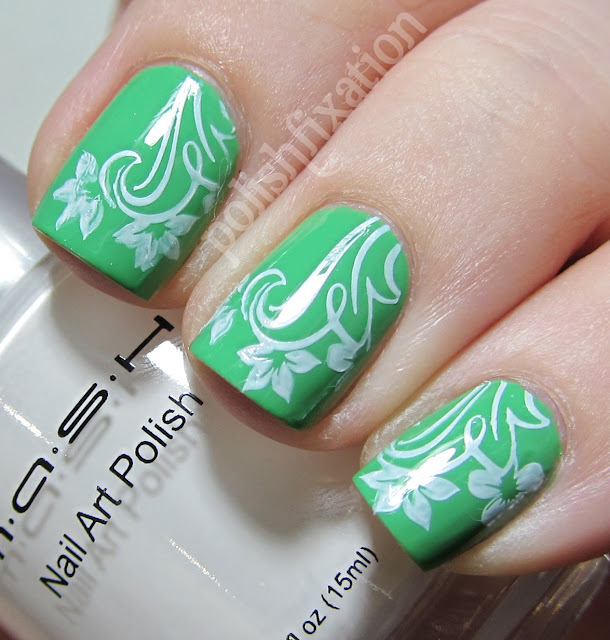 Gorgeous stamping! I need Mint Mojito!